It takes just a second for your pet to go missing. We receive numerous calls for lost or found pets. The Humane Society of the United States found return rates for dogs of only 14% and only 2% - 4% for cats. Perhaps you have not already been through the range of emotions and distress brought on by a lost pet. Between making posters, offering a reward, calling authorities and local pet places, animal shelters and driving around the neighborhood, there is plenty time, effort and stress involved with pet recovery. Imagine how this is compounded when you have school age children. It's certainly no less stressful for your pet! In this context, scheduling an appointment to have your pet microchipped at Advanced Care should be a no-brainer. Why Get a Microchip When I Have a Collar and Tags? Most pets become lost by bolting out the door without a collar or they pull loose out of the collar and run off. Most unclaimed pets are found without collars. Although just a bit larger than a grain of wild rice, a microchip is perhaps the most successful means of reuniting lost pets with their owners. A microchip carries a unique ID number, and this number is in a database that includes the name and contact information of a pet's owner. This database is as close as the internet. Most pet care facilities, including Advanced Care can scan a lost pet with a microchip and contact the owner within minutes. A pet microchip uses radio frequency identification (RFID) technology. RFID, as the name implies, uses radio waves to transmit information. An RFID tag in the chip stores data as well as a tuning capacitor and an antenna coil. The microchip is inert. It has no internal power source and doesn't actively transmit data. It just holds a unique ID number for your pet. The capacitor receives power from the scanner and sends it to the microchip. The microchip's information is transmitted back to the scanner through the antenna coil. The material that encapsulates the device is biocompatible meaning it's not toxic and doesn't hurt the animal's body. Your pet won't experience an allergic reaction to the device. Some microchips have a cover made of polymer to keep the chip from moving around once it's inside the animal, often referred to migration. The polymer works by encouraging connective tissue and other kinds of cells to form around the capsule to hold it in place. Microchips don't expire or wear down. They're good for the life of the pet. Most veterinarians, animal shelters and related facilities have scanners to read microchips. When energized, the microchip returns a signal to the scanner with the identification number. The scanner displays the ID number. Microchip placement in the St. Cloud market ranges between $50.00 and $60.00. Some microchip companies make pet owners pay a registration fee to put their pet's chip number on their database. AVID and HomeAgain are examples. Advanced Care Pet Hospital has priced their micro at the bottom of that price range and we have chosen a provider which DOES NOT require a registration fee. Advanced Care does not charge annual fees for microchip registration. 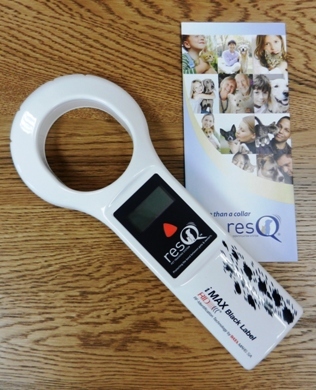 We use an ISO recognized universal scanner which detects, reads and displays microchip numbers from all pet microchips. When Biwabik, our Yorkie Poo, 1st came home with us, she high tailed it one afternoon. We were reunited less than an hour later after receiving a call from a nearby vet. Here is a link to the American Veterinary Medical Association's page on pet microchipping. Dr. Gerds has been an AVMA member since she began practicing 16 years ago.